“This is about as fancy as chicken gets in Venice,” Francesco says. 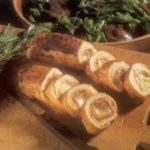 Chicken with cheese and prosciutto is a northern Italian combination of long standing, the ham and cheese is infusing the mild chicken with flavor. Francesco combines the pinwheel slices with mushrooms to serve either on a bed of greens or on pasta. This recipe can be expanded using as many chicken breasts as needed, to make a buffet party dish. It’s convenient because some of the preparation is easily done in advance. 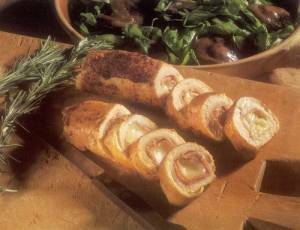 Once the chicken is cooked, the slices of stuffed chicken rolls can be arranged around the edge of a platter of arugula salad. Divide the chicken breast into 2 halves. Place each between sheets of waxed paper and pound them thin with a mallet, the flat of a large knife, or a rolling pin. Trim the rind from the cheese and cut it into 2 thick sticks. Wrap each stick with a slice of prosciutto and place in the center of each flattened chicken breast. Wrap the chicken breast around the prosciutto and cheese to make a sausage shape, then wrap this tightly in plastic and refrigerate for at least 1 hour. It can be refrigerated overnight if that is more convenient. Heat 2 tablespoons of the butter in a heavy skillet. Quickly brown the chicken rolls over medium-high heat, reduce the heat to low, and scatter the mushrooms in the pan, sprinkle the wine and rosemary in the pan. Cook, turning the chicken rolls frequently, 15 to 20 minutes. When the first bit of cheese begins to seep out, the chicken is done. Remove it from the pan to a cutting board at once. Cut each of the rolls at an angle into 6 slices. Cover to keep warm. Reheat the pan juices and season them to taste with salt and pepper. To serve arrange the chicken and mushrooms on a bed of arugula leaves tossed with olive oil and seasoned with salt and pepper. Warm the pan juices and strain them over the chicken.